Islamabad, famous as the City of Peace is a scenic haven of lush greenery, serene lakes and soaring mountains. This charming capital city of Pakistan also boasts several iconic landmarks and tourist attractions; the most impressive among them is the fascinating Pakistan Monument, built from granite with blooming flower-shaped architecture on the Shakarparian Hills. This iconic monument features four main petals which represent the country’s four provinces and three small petals depicting its three territories. 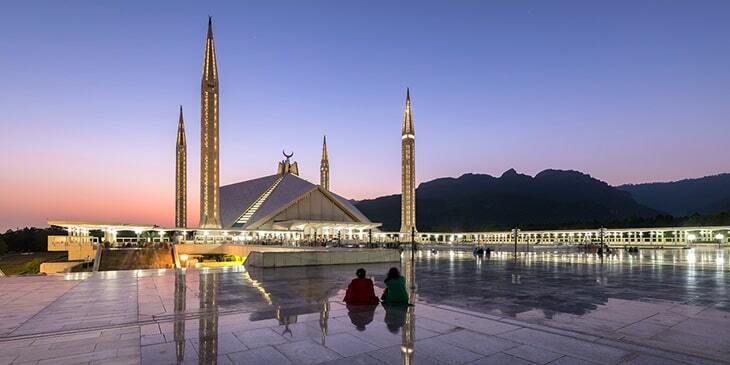 No trip to Islamabad is complete without visiting one of Asia's largest mosques, the majestic Shah Faisal Mosque, designed by Turkish architect Vedat Dalokay with a blend of traditional and modern architecture; you will be thrilled to discover the mosque’s unique desert tent shape. Islamabad also offers a range of outdoor activities; you can hike up Margalla Hills, stroll around the Japanese Park on Pir Sohawa Road and visit the Islamabad Zoo to spot the likes of great white pelicans, golden pheasants and Indian eagle-owls. Brightsun Travel offers cheap air tickets to Islamabad, so you can enjoy this land of unique tourist attractions. Islamabad boasts various state-of-the-art museums which allow an excellent opportunity to dive into Pakistan’s rich past. Visit the Lok Virsa Museum to learn about the country’s art and culture and discover a rare collection of traditional handicrafts, pottery, musical instruments, statues, embroidered costumes, old jewellery and intricate wood carvings. Afterwards, head to the Golra Sharif Heritage Museum to explore the history of the country’s railways; here you can witness several narrow-gauge steam engines, trolleys, cranes, coaches, signaling systems, mechanical models and railway carriages and saloons once used by royal kings. Another must-visit museum in Islamabad is the Pakistan Army Museum which displays several Turkish swords, Australian harpoons, Stone Age hand-axes and old rifles. You can also visit the Pakistan Museum of Natural History to learn about the ecology and geology of the country, and also explore specimens of whale sharks, blue whales, black bucks and Kashmir stags. Brightsun Travel offers various Islamabad cheap flights, so why not see what this wonderful city has to offer for yourself.